What’s this? A polished-looking video slot from Play 'n' Go, with lush, atmospheric graphics and slick gameplay? They’re not generally the attributes you dish out to one of the smaller slots developers around, Play 'n' Go, but Fortune Teller certainly shows that the makers of the sun, sea and sand slot Tropical Holiday and the African savannah-themed Photo Safari can do something a bit more creative when they want to. The betting range here, however, is pure Play 'n' Go - friendly and inclusive, with coin bets starting at just $0.02 and going up to just $0.25. While that may not set the high-end gamblers' worlds alight on this 5 reel, 20 pay-line slot, the jackpot may: it rocks in at a tasty $12,500. That's certainly enough silver to cross anyone's palms. 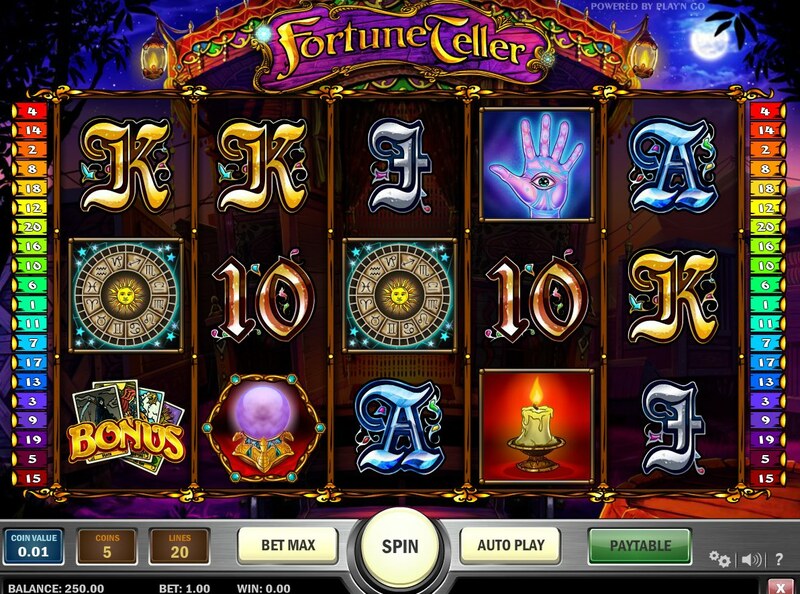 A flame-haired gypsy with tambourine in hand, a black cat, the gypsy caravan, palm with magic eye, crystal ball, and exotic-looking 10-through-Ace symbols; in look and feel, Fortune Teller is very similar to Microgaming’s take on the fortune teller story, Gypsy Queen. The Crystal Balls act as the game's Wild and substitute for all symbols except the bonus Tarot Cards and free spin Scatter. Three or more cats activate the free spins feature and remain Wild during the round. Free spins cannot be re-triggered within the round but double multipliers make up for it. Three or more bonus Tarot Card symbols, meanwhile, start the Tarot Card Bonus Round, essentially a classic Pick Me Bonus game - choose from a selection of mystical Tarot cards to reveal various prizes. Keep picking cards until you hit a Collect and your turn ends. Fans of slots like Random Logic’s magic-themed Mystery of the Tarot and NetEnt’s occult-tinged Voodoo Vibes should get a kick out of this simple and attractive slot. 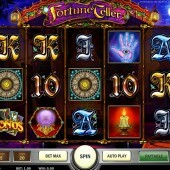 The bonuses won't blow you away, but the friendly bets make this a perfectly fine low-end slot. Lucky heather, anyone?